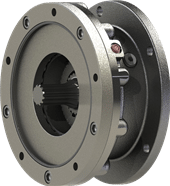 Specially designed to suit the SAI Hydraulic Motor the range of Spring Applied Hydraulic Pressure Released Brakes offer static braking torques from 500 Nm to 8000 Nm. There are three sizes of brake available. 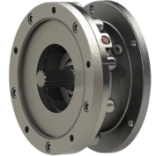 The F5S which fits the GM05 Motor, the F21R and F21DR which fits the GM1 and GM2 Motor and the F80S, which is suitable for coupling to the GM3, GM4 and GM5 Motors. Fits to 05 and 1 Series Motors. The braking torque of the F21R is proportional to the number of brake springs. They can be supplied with an odd number of springs from 9 to 19 giving braking torques from 800 Nm to 1800 Nm. With a lower number of springs, the brake release pressure will be lower. The standard number of springs is 19. Fits to 2 and 3 Series Motors. The braking torque of the F21R is proportional to the number of brake springs. They can be supplied with an odd number of springs from 9 to 19 giving braking torques from 800 Nm to 1800 Nm. With a lower number of springs, the brake release pressure will be lower. The standard number of springs is 19. Fits to 3, 4 and 5 Series Motors.